Make our gorgeous new Montana home near Yellowstone Park your vacation destination this summer! 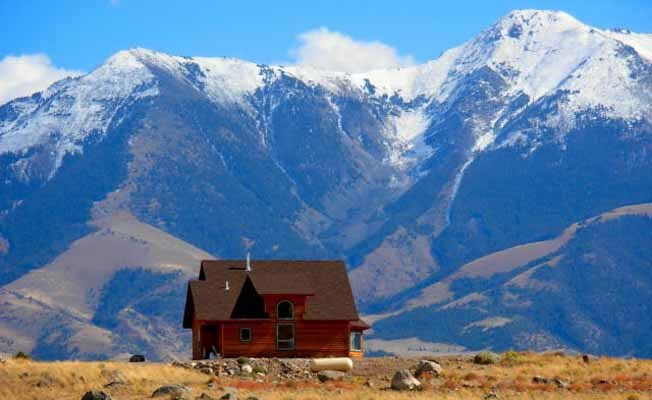 Rocky Mountain Heights is a lovely welcoming home, ideal for family vacations and reunions in the Yellowstone Park area. In every direction are breathtaking scenes of the Yellowstone River, Paradise Valley and Emigrant Peak. The home's two decks are great for viewing or just for relaxing with a barbeque cook-out as you enjoy the scenery. There are two very comfortable living spaces - a spacious living and dining area with cozy gas fireplace, and a gathering/game room with table tennis, pool table, and longers for TV or movie watching (DVD library available). The modern kitchen is fully stocked with everything you need: pots & pans, bakeware, bowls, dishes, microwave, dinner service for 12, organic tea, coffee and spices. A huge dining table creates a great gathering space for family and friends, with more seating at the dining bar. Our vacation home is situated in the very heart of the Paradise Valley. In just about 5 minutes you can be down at the Yellowstone River - fishing, rafting, or swimming at the little "beach" by the Emigrant Fishing access. You are ideally located for outdoor adventures - an easy drive to Yellowstone National Park (30 minutes) with its fishing, hiking, geysers, waterfalls, fabulous wildlife viewing, and my personal favorite for mineral soaks - the Boiling River Hot Springs. Also nearby is historic Chico Hot Springs Resort with its natural hot springs pool, trail rides, sporting clays, day spa, and exceptional dining. Other activities in the Valley include whitewater rafting, scenic flights, guided trips and tours into the Park, art galleries, rodeos in June and July, and in August, the Fiddler's picnic. The home has two master suites on the main floor, one with a king bed and spacious bathroom with a beautiful tiled shower. The other suite has a queen bed and private bathroom with a tub/shower. Downstairs are two more bedrooms - one with a queen bed and the other has twin beds. Additional sleeping space is available using two loungers in the family room which open out to full-sized beds, each accommodating two people for sleeping. A third full bathroom serves this floor. We look forward to welcoming you to Paradise Valley and our beautiful Montana home, a place to make your vacation something special you will remember for many years to come.